Today, I am releasing a free personal portfolio template. This is a single page template with awesome transition effect. Design of the template is based on the bootstrap. You only need to change profile picture and content and your website is ready. Template is responsive, so your website will look perfect on all kind of desktop and mobile devices. 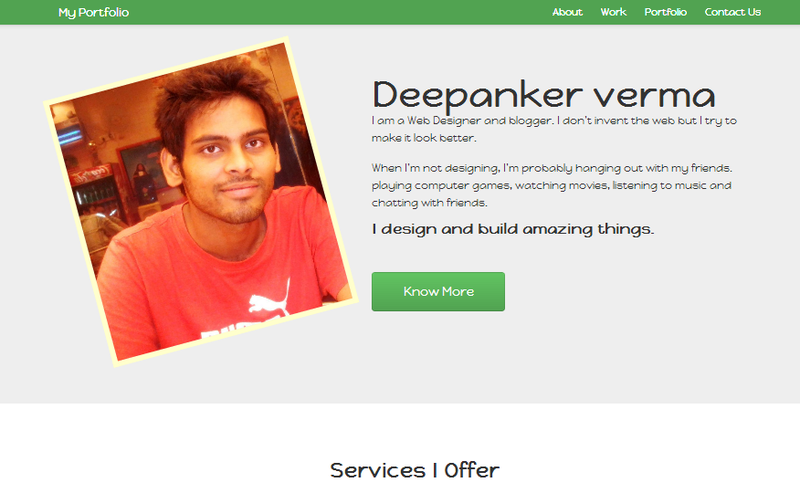 Service section uses Bootstrap glyphicons which you can change it as per your need. I have added three service boxes in a single row. Portfolio section of the template contains 4 items in a row. You can add as many rows you wish. Whenever you click on any portfolio item, it will open the image in lightbox. This lightbox uses popular Lightbox plugin by Lokesh Dhakar. It has few issues with Bootstrap, but I managed to fix it all. You are allowed to download and this template for free. If you are not able to customize it in your way, you can contact me for customization. Share this template with friends and help us to grow. If you want this template for WordPress, I can do it for you. Contact me.